As additive manufacturing technologies mature, automation has become a key concern for those seeking to advance the production rate of the technology. For small to medium-sized enterprises (SMEs) however, the capital outlay on robotic equipment can prove a barrier to investment in automation and further business development. Danish collaborative arm manufacturer Universal Robots is seeking to challenge the preconceptions of introducing automation at SMEs. Universal Robots specializes in the development of collaborative robots (cobots). The current range includes three arms suited to the management of rising payloads: 3kg, 5kg and 10kg, and weighing 11kg, 20.6 kg and 33.5 kg respectively. The footprint of these arms is also no more than Ø 190 mm, making them a suitable option for compact workspaces. As the name suggests, cobots are made to work alongside humans in a production environment. Universal Robots’ devices are certified for use alongside operators without the need for a safety barrier. Force-sensing technology means that when contact is made, Universal Robot arms automatically freeze, avoiding the threat of damage. 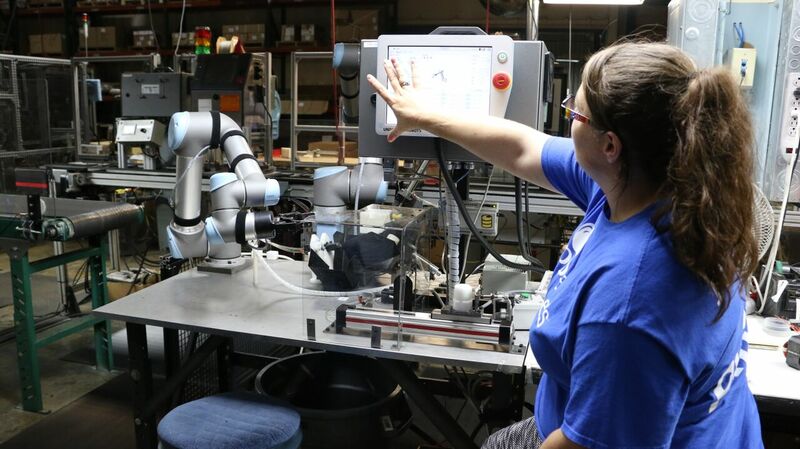 A cobot operating alongside a worker. Photo via Universal Robots. Furthermore, in certain instances, the robot arms may improve the safety of an industrial space by taking over the more dangerous machinery jobs and repetitively straining tasks performed by workers. Common tasks conducted by robot arms are, kitting (i.e. collecting multiple components to make a kit), degating (disassembly), pick and place, packaging and machine tending. Applications in 3D printing include management of a 3D printer farm, i.e. removing and replacing build plates, or sorting finished parts for delivery. The function can be easily programmed and redeployed to meet the specific needs of a given production line. Furthermore, the company reports that the average return on investment of its arms is between 2 and 8 months. Programming the cobots. Photo via Universal Robots. Universal Robots has compiled a guidebook on “How to Get Started with Cobots in 10 Easy Steps” in an eBook, free to download here. For more information on robot arms and to get started with automation, visit Universal Robots. Stay updated on the latest 3D printing news by subscribing to the 3D Printing Industry newsletter. Also, follow us on Twitter, and like us on Facebook. 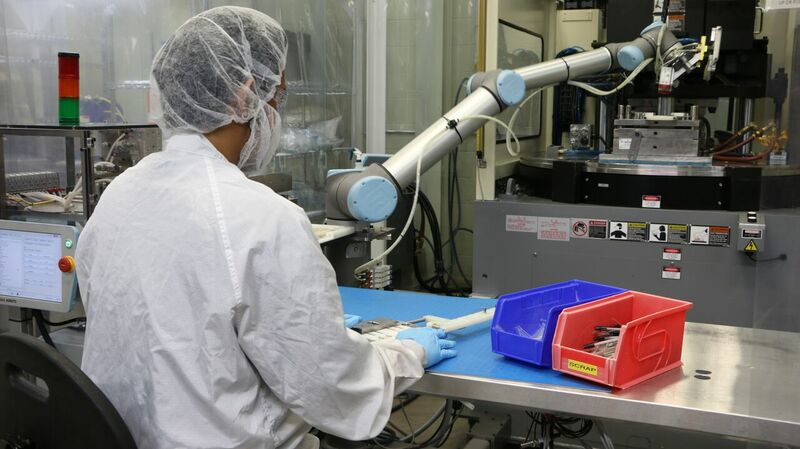 Featured image shows a cobot on the factory floor. Photo via Universal Robots.